Factsheet Five T-shirt with various issues of the zine, showing how the format changed over time. Factsheet Five was a periodical containing mostly short reviews of alternative press or privately produced printed matter along with contact details of the editors and publishers. In the 1980s and early 1990s, its comprehensive reviews (literally thousands in each issue) made it the most important publication in its field, heralding the wider spread of what would eventually be called fanzine or zine (pronounced "zeen") culture. 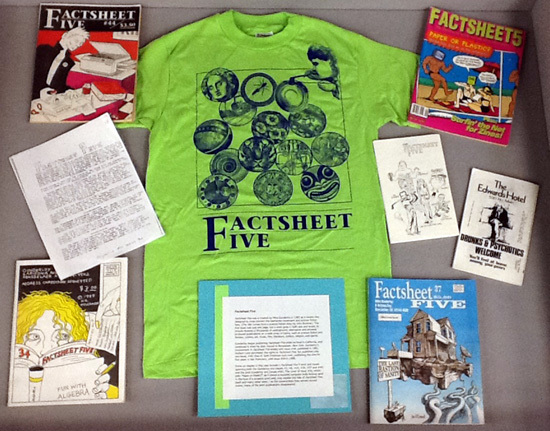 Before the widespread adoption of the web and e-mail beginning in the mid-1990s, publications such as Factsheet Five formed a vital directory for connecting like-minded people. The magazine was originally published in 1982 by Mike Gunderloy on a spirit duplicator in his bedroom while he lived in an Alhambra, California, slanshack (a house shared by fans of science fiction). The original focus of Factsheet Five was science fiction fanzines. (The title comes from a short story by science fiction author John Brunner). Gunderloy later moved to Rensselaer, New York, where he continued to publish. In 1990, Cari Goldberg Janice and (briefly) Jacob Rabinowitz joined as co-editors. Gunderloy quit publishing Factsheet Five following the completion of Issue #44 in 1991. Hudson Luce purchased the rights to Factsheet Five and published a single issue, Issue #45, with the help of Bill Paulouskas. This attempt to revive the publication was not a successful endeavor. In 1992, Mike Gunderloy, the creator of the Factsheet Five magazine, gave the New York State Library his "zine archive" as well as his business files related to producing Factsheet Five. Covering the period 1982 to 1992, this 300-cubic-foot collection represents one of the largest collections of alternative press publications for that period in the world. Factsheet Five began as a review zine designed to cross connect the libertarian movement and science fiction fans. Mike’s non-judgmental reviewing style and his openness to reviewing whatever he was sent soon made Factsheet Five the center for punk zinester networking. Other zine communities which were emerging at that time – such as wrestling fans, B-movie fans and the pagan religious communities – used it as well. In addition, older users of the alternative press, such as political groups from both the left and right, sent zines to Mike, knowing that his review would help them reach a larger audience. The archives, accumulated while publishing the magazine, is an excellent resource for researching not only zines themselves but the communities in the 1980s which used them as a communications media. The collection has been divided into four series: zines, correspondence and business records, mail art, and ephemera. This series is the largest part of the collection representing about 250 cubic feet of the total. Approximately 100 cubic feet were organized by Mike in alphabetical order by zine title. This part of the collection is open to researchers. The other 150 cubic feet represent unsorted material, mostly zines, but also correspondence, business records, mail art and ephemera. Altogether, it is estimated the collection consists of about 10,000 titles. An ongoing project to sort this material was begun in 1992 in which individual titles are being entered into the library's online catalogue. As of October 2010, it is estimated that about 6,000 zines or about one-fourth of the collection has been catalogued thus far. To view a list of cataloged titles, enter a "word or phrase" search in the State Library's online catalog by using factsheet five as the search phrase. Catalogued zines file alphabetically by title. Uncatalogued zines file separately, but are also arranged alphabetically by title. Oversize (folio-size) items are housed separately from smaller (octavo- and quarto-size) materials; these items are also arranged alphabetically by title depending on catalogue status. While the subjects covered by the zines are broad and not easily categorized, there are several subject areas which scholars may find particularly interesting. Because many of the zines were produced during the build-up to and execution of the First Persian Gulf War, these zines provide a wealth of opinion and commentary from people in all walks of life, both in the United States and abroad. Another subject area covered in-depth is the punk rock movement and its off-shoots. The collection pre-dates the rise of the Riot Grrl movement, but feminist and other women's issue zines are well represented in the collection, including some early pre-Riot Grrl zines by women punksters. Alternative political zines of both the left and the right in the United States are abundant. Some of the political ideologies included are environmentalists, anarchists, libertarians and white supremacists. This list is in no way exhaustive. If you are conducting research on any cultural or political group that flourished in the 1980s and believe alternative publications might prove useful, you are urged to contact the Manuscripts and Special Collections unit of the New York State Library to discuss whether Factsheet Five might be helpful. This series represents Gunderloy’s correspondence and other records related to producing Factsheet Five. The collection is currently 22 cubic feet of material, although there is additional material in the unsorted zine boxes. The correspondence is not organized but a box inventory is available. Additional correspondence can be found in the folders of individual zines. An unpublished guide to 17 boxes in this series is available in the repository. This series consists of mail art and other graphic material sent to Gunderloy as part of the mail art exchange and the miscellaneous "for sale" material that Factsheet Five listed. This collection is not currently arranged. Due to the nature of this material, access to this part of the collection is restricted. Everything not listed above. Although largely unorganized, this part of the collection is open to research. The largest portion of this collection is musicians' press kits which are organized by recording label name. Much of the rest of the material is announcements of concerts, book publications and political events.